Fractionate, distill, dilute, transpose, translate, dissect, rearrange, transmute, intuit, feel, sense, divine, combine, shred, worry, assemble, measure, time, assess, weigh, balance… To every thing there is a season, and a time to every purpose under the heaven. Amy Putkonen at http://www.taotechingdaily.com/ invited me to post on her blog in her response to my entry here at Tao Te Ching Chapter 4. Amy’s invitation is to blame for what follows, and I am completely blameless and not responsible. I invoke the privileges of my age. I can dodder and wander because I am a geezer, and geezers do that. We wander along the water’s edge in baggy pants with a bag full of crumbs, and cast our bread upon the waters. We mumble incantations reminiscent of some type of spiritual Tourette’s syndrome. We seize unwitting passers-by and bewilder them with momentary howls of odd wisdoms and then turn them loose, forgetting what we were doing in the previous moment, and why. Our basic nature and long season of unique nurture have conspired to streamline and jumble the synapses of our cognition. At our best we make odd sense, at our worst… Well, let’s just hope that doesn’t happen here. Amy’s invitation to pick whatever I want and her faith that it would be fun and good led me to respond that I would like to do that and we could see together what transpired as the breath of inspiration returned to the air. While I waited for inspiration I caught myself holding my breath. It was the fun and good expectation thing. God knows I have demonstrated the ability to be neither countless times. I know better than to do that, to hold my breath. I’ve experienced, observed, registered and catalogued a lot of stuff in my years. I’ve developed a conscious recognition of the choices that pop up in life, and have a good grip on which choices prove to work out for me. Eggs or pancakes, doorway or wall, resentment or acceptance, hallucination or reality, separation or union. Fret or relax. If the small case i is baffling, think about it later. I’ll give you a hint. It’s about the words part of me, and the Tao Te Ching informs us all of the word thing, and how it works, and how it doesn’t. The point is, I don’t know what the next offered choice will be. I don’t know what I’ll choose, how I’ll act or react. There are times when I think that my age and experience and conscious awareness should have given me the ability to reflexively respond “correctly” and with grace to every single thing I feel I am confronted with. On certain days I am downright grumpy about the omission of my own total enlightenment in this incarnation and unkindly disposed to growl and grouse about it. Because I still encounter things I feel are grotesque or ghastly or infuriating or just plain wrong by my lights. At times I feel the things I encounter are holding the potential for judgment and rejection and marginalization of myself or others. My first response? I hold my breath. And acceptance and peace and grace go begging. I hold my breath, and everything seizes up. Alarms start going off below the threshold of consciousness. Somewhere, something detects an anomaly that, if not corrected, will lead to oxygen deprivation and an abrupt and unscheduled collision with whatever hard and unyielding objects are between me and gravity. I begin to worry about my hips. Geezers do that. It gets worse. I begin to worry about it all. And soon that good old feeling of impending doom appears. It’s really weird how pressurized my chest gets when I’m holding my breath. Pretty soon it spreads and my head feels like it’s going to explode. My geezer klaxons go off, warning me of imminent harm, advising me to immediately vacate the premises I am occupying. Where does all this stuff come from? Can holding your breath really do all this? A mentor of mine, an anonymous and strangely unself-conscious master in an odd wrapper, gave me a tool for this long ago. Then he roared with laughter and dug out a huge wad of chewing tobacco from behind his cowboy mustache and shot it across the room. It landed on the potbelly stove next to me and sizzled there like the new awareness sizzling in me. In that moment the light appeared. I sighed a deep breath of relief then, and experienced a sudden peace in the empty fullness that remained. It’s just a feeling. That’s all that is. It’s not a pain to fight or flee, it’s not a goad, it’s not a trumpet call to action. It’s a feeling. It will pass. The tool, the trick, the solution is simple. Just let it go. Breathe it out. What to do with 10,000 things? Breathe them in, let them fill you up. Breathe them out, let them go. Rest in the empty fullness between. 7 Responses to What is My Spiritual Practice? So you’re telling us that your inspiration does not come from inhalation, but from the exhalation following the inhalation and the repetition? I like it. Your inspiration does not come from inhalation, but from the exhalation following the inhalation and then repetition until expiration. LOL! Absolutely! I love to laugh while breathing! Love it, love it, love it! Thanks, Louis! Yes. I think… It’s like this. Sort of. Your question comes to me. I take it in, and hold it in at first because it’s a question, and I feel a sudden incumbent responsibility to produce an answer. As long as I hold it in it’s subject to the definitions and limitations of my dualistic mind. I’m holding it in, not letting it flow through and out and back in again. Said another way, why would I hold on to something which becomes stale circulating in a closed system when I could open up and let a whole, fresh thing come in? How many times do we struggle and agonize with something until we get to that place where we sigh, let it go, and let it be whatever it’s going to be and turn out however it does? And having released it, and rested, we later see that it wasn’t as big a problem as we thought, and it did work out, and it even worked out for the best for all concerned? Inspiration is within, without and throughout everything. When held exclusively within, however, it hangs up. The Tao is right, words can’t catch what we can know and experience, as this reply demonstrates. Yet from the words, somehow, we are inspired to know. As long as we remember to breathe. It’s not about all the words here. 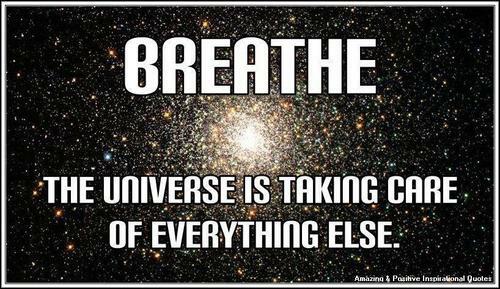 It really is, simply, only about breathing.